To read complete review click: here. Love Triangle, 2013. Oil on canvas, 12 x 16 in. Sean Downey’s work often depicts liminal spaces, somewhere on the cusp of a developed and a natural world—a polluted, desecrated frontier, botched attempts at contemporary edenic encampments. Characters come across as archetypes more than individuals, owing to their quasi-recognizable traits and dress, and this imbues the work with a sense of déjà-vu. But, beyond the subject matter itself, Downey’s strength lies in his use of form to tell an ongoing narrative, which is just as much about the object, and the process, of painting. Some works, for instance, appear to use the act of representation to shift an object’s status from detritus to icon. 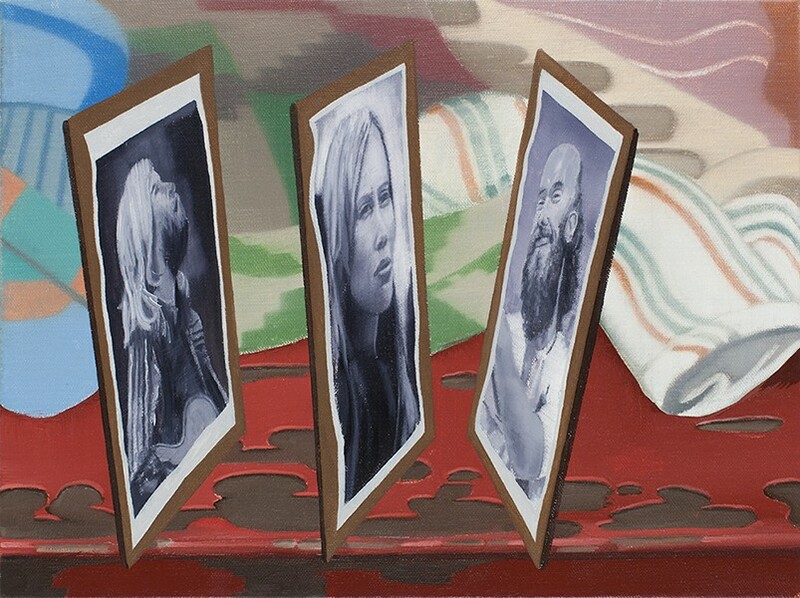 The smaller Love Triangle (2013) and Four Members of the South Fork Fishing and Hunting Club (2013) each skew two-dimensional photographic planes, endowing them with enough heft to defy gravity. This has the uncanny effect of breathing life into the faces photographed: their gaze becomes active, interactive, significant once more. The printed document lives in a new context as a painted object. Downey also seems highly attuned to the theatrics of the frame. In Go to School Go to School Drop Out Drop Out (2013), and thoughtACTIONthought, Best Wishes (2013), each composition is symmetrically centered on a scene that possesses the passive, empty quality of a stage-set. These are flanked with smaller scenes, which contain the most active elements of the composition. Skirting the canvas, they observe contradictory rules of perspective. As a result, there is no unified vision or space, no single illusion in which to lose oneself. This formal strategy gives a nod to the proscenium — the part of a theater stage which extends beyond the curtain — revealing and reveling in an awareness of the stagecraft of painting. Read Stephanie Cardon's entire review: here.